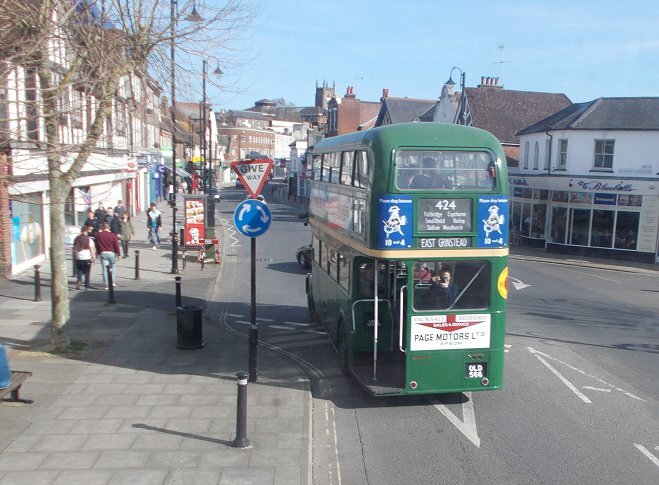 Prepared by Ian Smith, 1st May 2015. 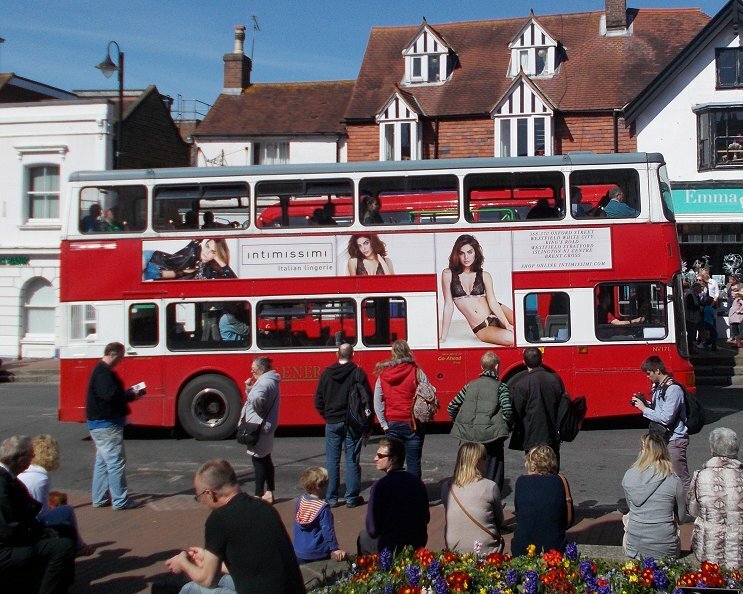 East Grinstead was busy. 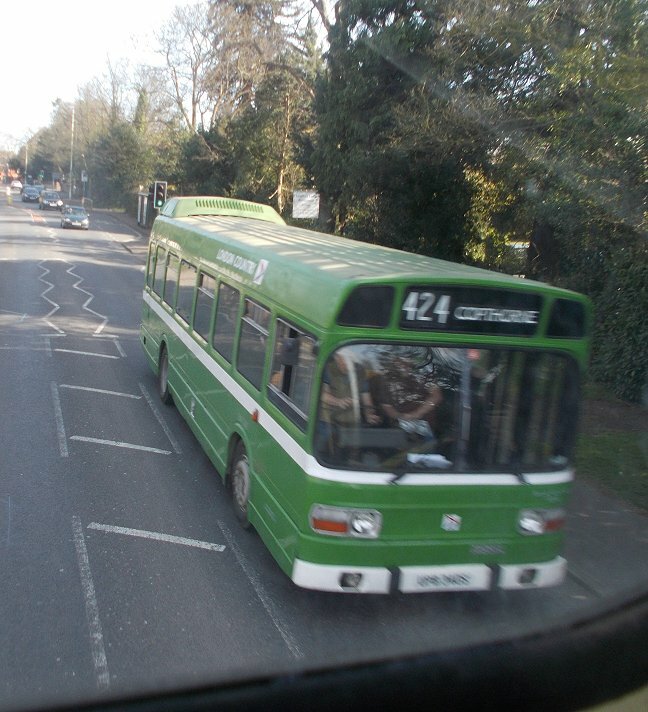 Modernised but demoted ex-GreenLine RF146, in short-lived London Transport green and canary yellow livery, was setting off on another 494 trip to Oxted, while LT-liveried XF3 was also heading out, on a 438. "Fruitmaster" FRM1 was standing on the other side of the road, after another foray on the 424 to Copthorne and back. Looks good! 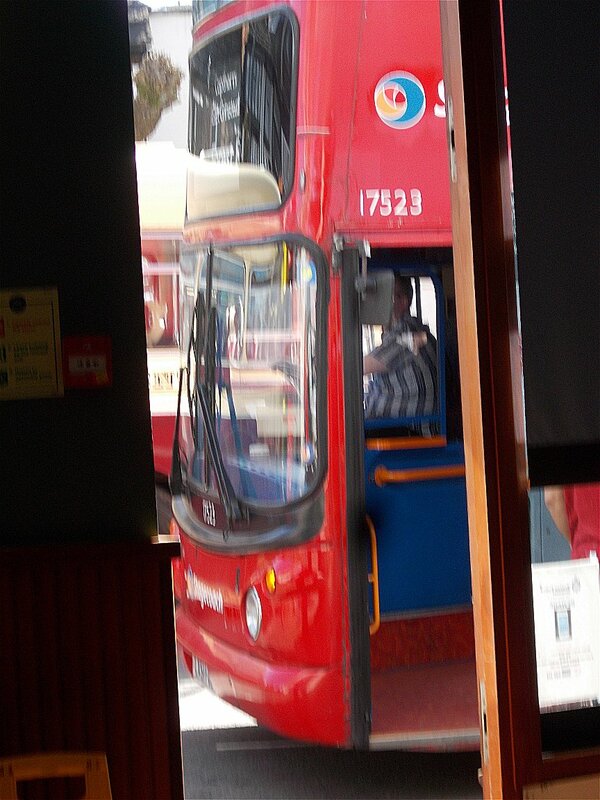 I bought a sandwich and a drink, and went to sit near the War Memorial, where I could watch the passing traffic. 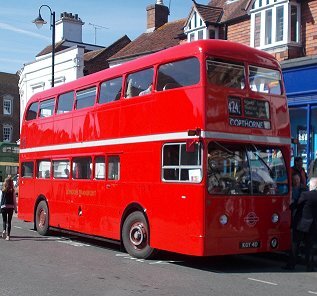 Very eye-catching in its 1933-style livery was Volvo Olympian NV171. 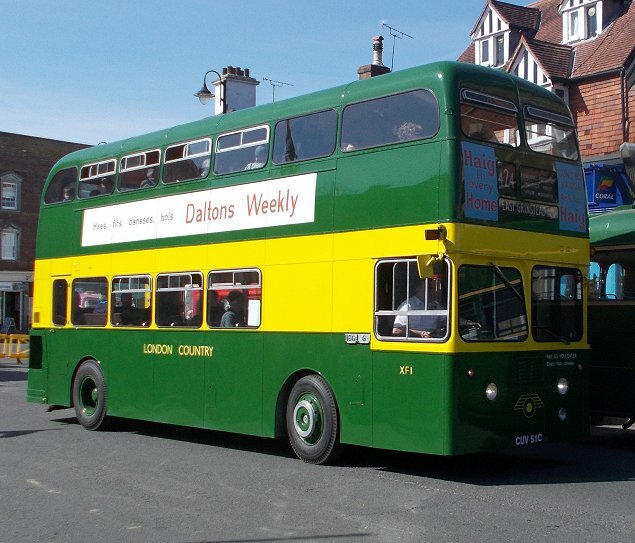 There seems to be a trend in offside advertising carried by this group's preserved buses! 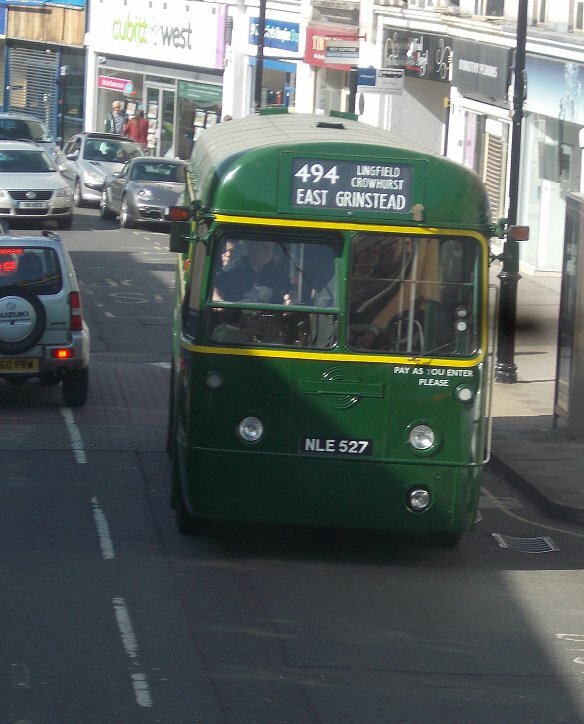 East Grinstead being a border town between London Transport and Maidstone & District, the event welcomes buses from the latter as well. 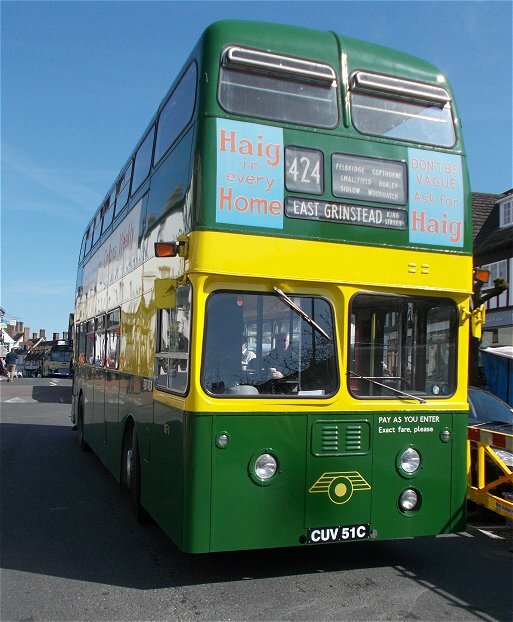 Very good-looking was Lynx 3043 (originally with Merthyr Tydfil), which was working on tours via Hartfield, taking in parts of former M&D route 135. 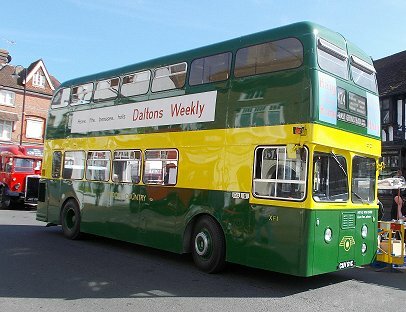 What a superb livery this is. 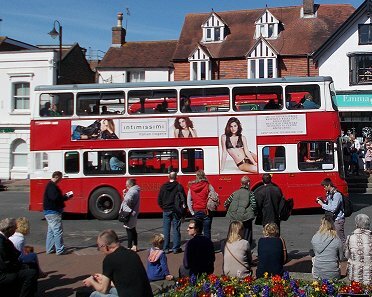 I popped into Cafe Nero for a coffee. 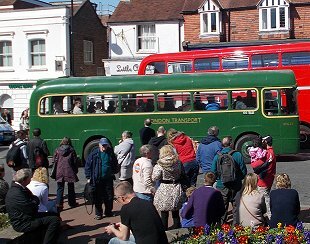 Whilst I was there, just for an instant Trident 17523 filled the cafe doorway as it headed east for Forest Row once more. When I emerged onto the street again I had an excellent view of East Kent Reliance WFN513, which was also working on the 135 Hartfield Tours. I had a choice of XF1 or XF3 on their 50th anniversary. I have previuosly travelled on XF3, so crossed the road to XF1, which was ready to head for Copthorne. 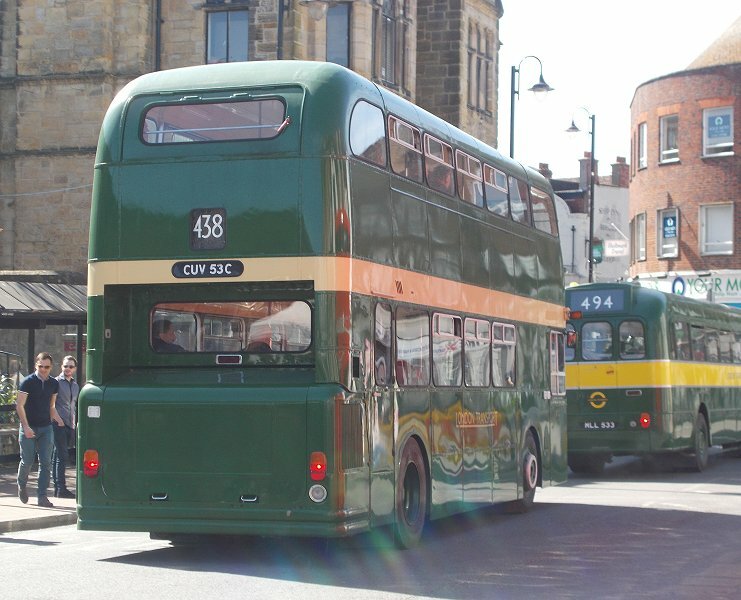 The restoration is immaculate, both outside and in. 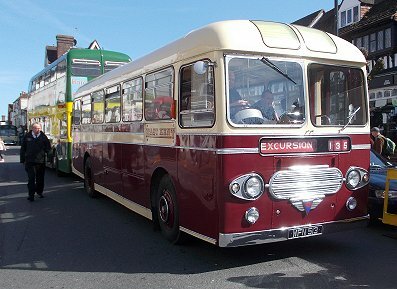 It even has the door to lock off the stairwell for single person operation, as required by the law at the time the Fleetlines were introduced. I went upstairs for a front seat. 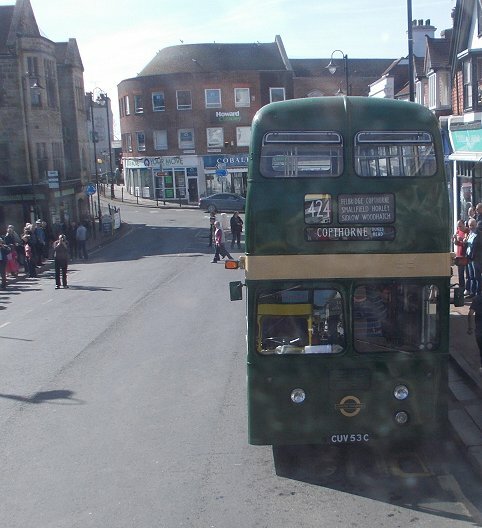 XF3 pulled round the bus in front to get to the War Memorial stop, meeting XF1 head-on as it went. 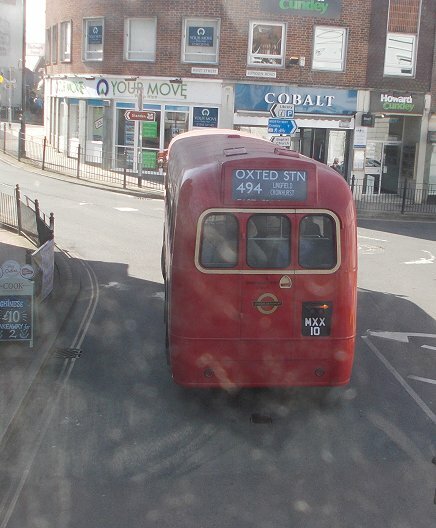 While we loaded up RF368 set off for Oxted on the 494, and Titan T684 headed out to turn at the station, having arrived on a short-working 438 from Forest Row. (Sorry about the mucky photos: the sun was catching the dust on the front windows of my bus). 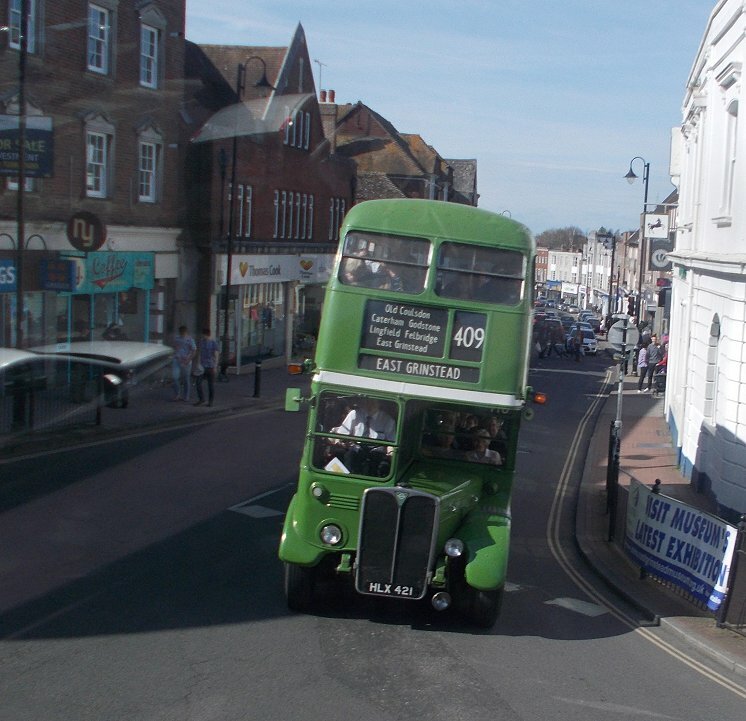 We set off, round the corner and down the hill. 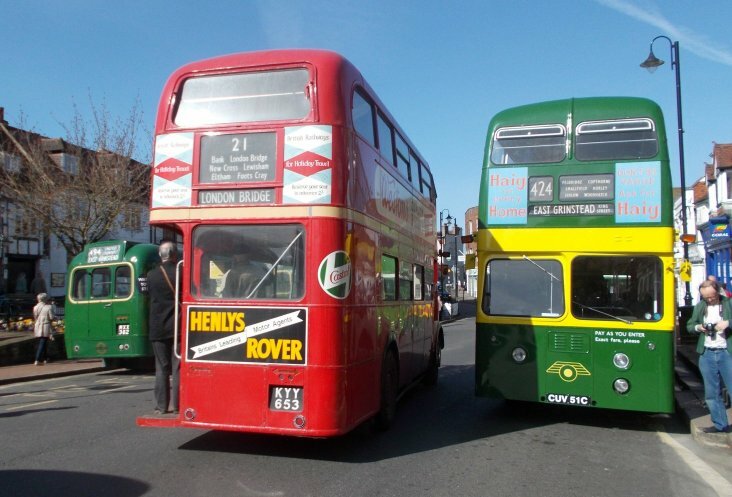 Two buses dating from the turn of the 1940s and 1950s, but both in 1970s liveries, came up the hill. 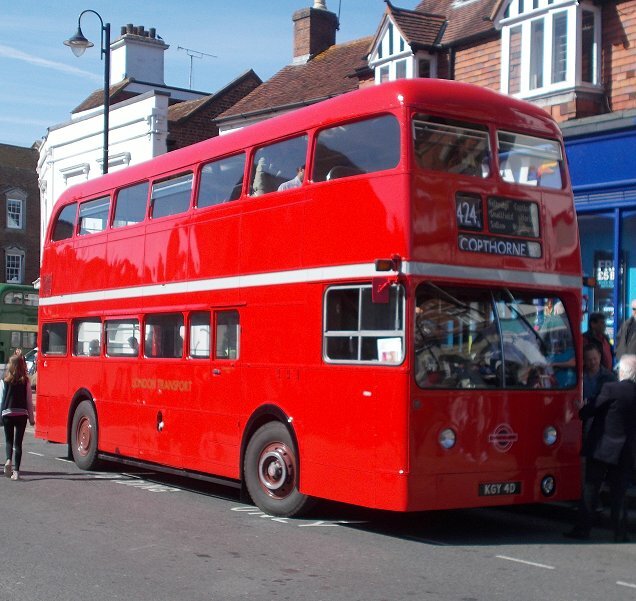 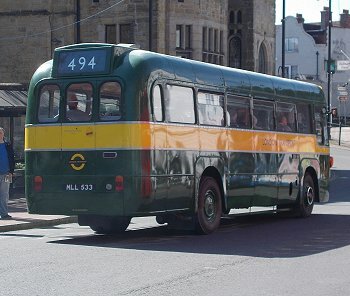 RT604, new in 1948, although fitted with a later body, is famous as the last London Country RT in passenger service in 1978, and wears the National Bus Company livery of that time. 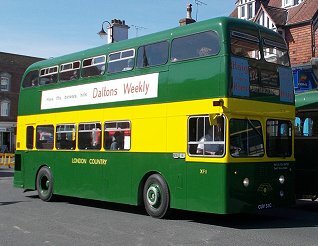 RF308 was new as a Country bus, RF527, in 1953. 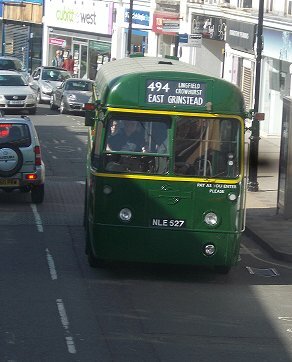 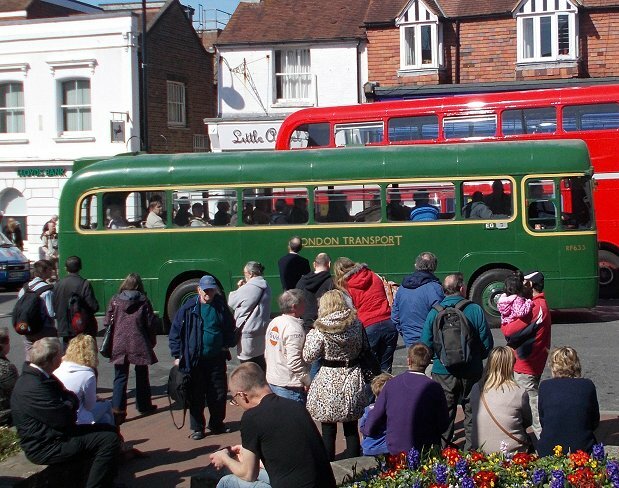 It was then converted to a makeshift Greenline configuration in 1956, only to be returned to bus status in 1962, to displace GS buses from Chelsham on the Oxted routes. It wears the dark green with canary yellow trim of 1970s London Country as it arrives on a 494 from Oxted. 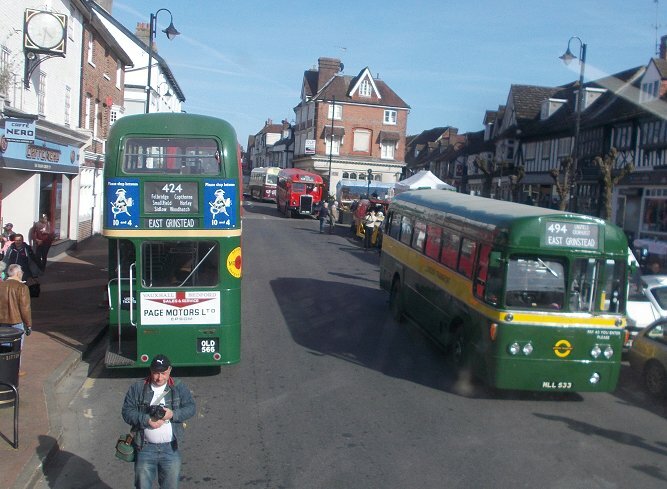 We headed north, down to the stations where we passed T684, then on towards Felbridge. 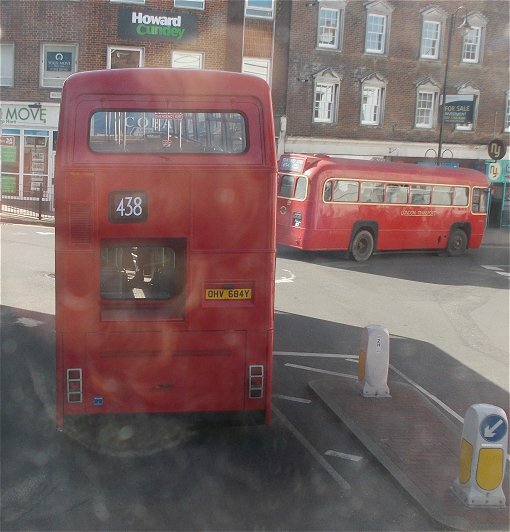 We forked left there, then again onto the Crawley Down road. 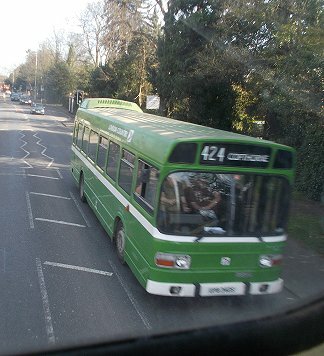 We met AN53 coming back on the 424. 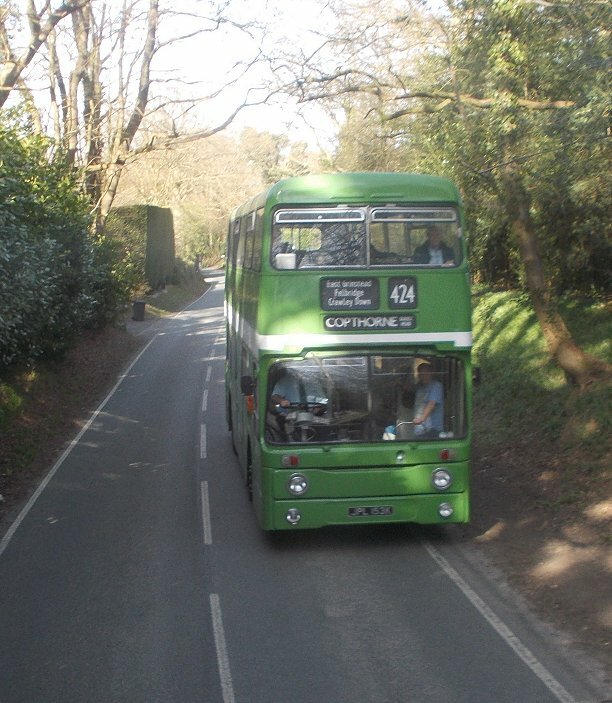 At Copthorne we made the clockwise loop to come back to The Dukes Head, and retraced our route through Crawley Down to Felbridge. 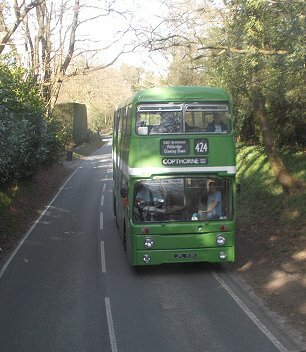 As we headed back towards East Grinstead on the main road we met Leyland National SNB340 heading for Copthorne. 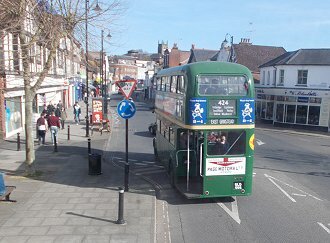 We went round the station loop, then stopped at a bus-stop to let off a passenger. RT4779 pootled past, and preceded us up the street to our terminus outside The Crown. 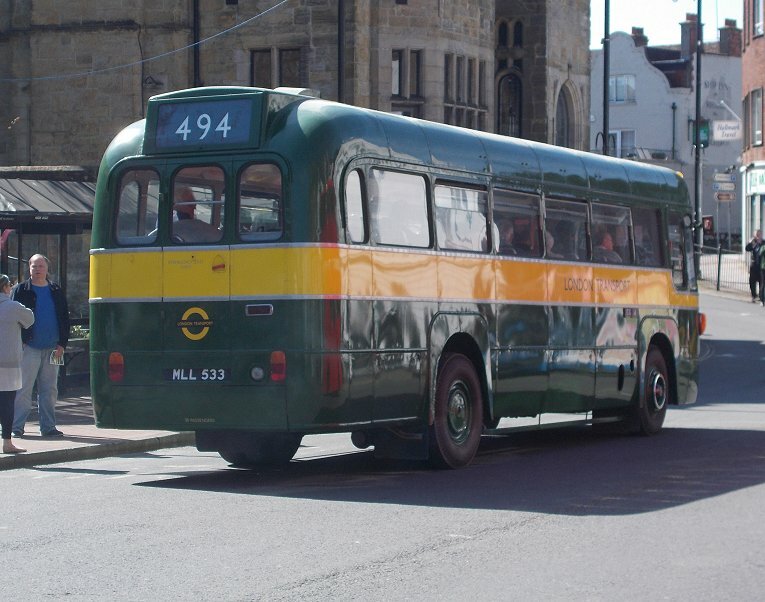 Part Seven: 409, 485 and 403.